So, you've successfully generated a key pair for yourself in PGP. Perhaps you've even gone so far as to upload your new public key to the keyservers. In short, you're ready to start using PGP in earnest. But there's one more thing you ought to consider doing: generate a key revocation certificate. You probably know that PGP allows you to revoke your key so that no one can use it to encrypt email to you. Perhaps your private key has been compromised; or perhaps you've generated another key pair and prefer to use that key instead. Whatever the case, you can revoke your key. Once your key is revoked, PGP can then contact the keyservers and update the copies of your public key on the keyservers so that others will know that your key is revoked. When you revoke your key, PGP will prompt you for the passphrase for your private (or secret) key. You can't revoke your key unless you have both the private key and the passphrase for that private key. And therein lies a potential problem. You might forget the passphrase to your private key. Without the passphrase, you can't access your private key and decrypt email and files sent to you, thus making your key worthless. Moreover, without the passphrase, you can't even revoke the key to let people know that they shouldn't use that public key when encrypting messages and files to you. You might lose the private key to your key pair. Your hard drive might crash, rendering your PGP key rings inaccessible. Even backups of your key rings to floppy disk or CD-ROM can be lost or be damaged. Without the private key, you won't be able to decrypt messages and files sent to you or even revoke the key so that others won't use it when encrypting things to you. If either one of these events happens, you're out of luck. You won't be able to decrypt anything sent to you that was encrypted with your public key, because you don't have the private key or the passphrase to access the private key. Still worse, you won't be able revoke the key so that other people won't use it when encrypting messages or files to you. And the PGP keyservers will not let you simply remove the key either. They'll let you revoke it, but you won't be able to do even that because you don't have the private key or the passphrase for the private key. There's a good reason why the keyservers won't let you revoke or remove your public key without the passphrase and private key: if you could do it, anyone could do it. Think about it. At that point you're essentially in the same position as anyone else who doesn't have access to your private key or the passphrase for the private key. If there were some way for you to revoke or remove your key from the keyservers without the passphrase and private key, anyone could. The result would be chaos on the keyservers as people revoked and removed (and even replaced) other people's keys. I think you begin to see the problem here: a lost passphrase or private key could cause you a lot of headaches. There is a simple solution to this problem: generate a key revocation certificate. A key revocation certificate is a special, revoked copy of your public key. You can generate a key revocation certificate and store it for future use. Key revocation certificates are especially useful if you've forgotten the passphrase to your private key and you need some way to "disable" or revoke that key. Since you've forgotten the passphrase or lost the private key, the only way to revoke the key will be with a revocation certificate that you generated earlier (when you still remembered the passphrase and had the private key). In a way, a key revocation certificate is a kind of insurance plan that lets you keep ultimate control over your key, even if you lose the private key or forget the passphrase. In order to use a key revocation certificate, however, you've got to generate one now, while you still have the private key and while you still remember the passphrase to the private key. Once you've generated the key revocation certificate, you can export it to an ASCII Armored file (.ASC) and store that key revocation certificate file in a safe place. You can even print out a copy of your key revocation certificate (so that it could be scanned in to a file at some future point). If and when disaster does strike, you'll still have that key revocation certificate, which you can import onto your PGP key ring and distribute to the keyservers to revoke your key. Again, though, in order to use a key revocation certificate, you've got to generate one now, while you still can. In what follows we'll go step-by-step through the process of generating of key revocation certificate. We'll also discuss how to store that key revocation certificate so that you can use it in the future. Finally, we show you how to use your key revocation certificate, should you ever need to revoke your key. Most of the screenshots you'll see are from the new PGP 8.0 from PGP.com, but they'll be similar to what you'll see in almost any recent version of PGP since PGP 5.0. For instructions on creating key revocation certificates in Gnu Privacy Guard (GPG), see THIS section from my GnuPG Command Reference examples page. Before we plunge into the actual step-by-step process of generating a key revocation certificate, let's describe briefly what we'll do. First, we'll open PGPkeys and disable keyserver updating (we don't want the keyservers to be updated when we revoke our key). Then we'll export our key pair (both the public and private key) to an ASCII Armored file (.ASC). Next, we'll revoke our key and export the revoked public key to a file -- this is our key revocation certificate. Once we have our key revocation certificate, we can delete the revoked key pair off our key ring and re-import the good (non-revoked) copy of our key pair (which we created earlier). Finally, we'll discuss a few ways to back up and safeguard our key revocation certificate for future use. So, let's get started. Almost everything we do here will be through PGPkeys, the PGP key ring management program. PGPkeys will open to the main window, displaying all the keys on your keyring. Before we do anything else, we need to disable PGP's keyserver updating for key revocation. Since we'll be revoking our key in just a bit, we don't want PGP to forward that revocation to the keyservers. ...and click on the Servers tab. Make sure the "Revocation" box near the bottom in not checked. It should be unchecked by default, but verify that it is in fact unchecked. After you've done so, click OK to return to the main PGPkeys window. Before we create the key revocation certificate, we need to back up our key pair so that we can re-import it later. Right-click on your key pair, and select Export... from the context menu. 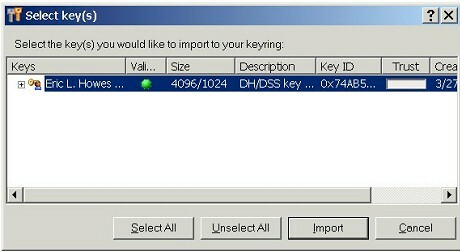 Select a directory to export your key pair to. And make sure that you've got the "Include Private Key(s)" box checked (we need both parts of our key pair to be exported). 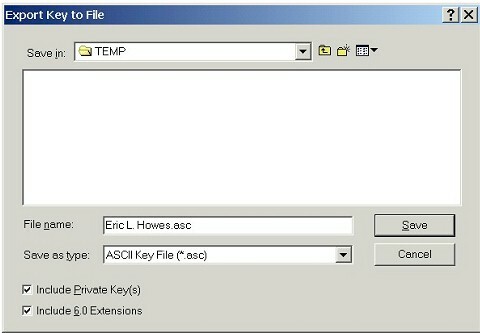 Click Save to export your key pair to a ASCII Armored file (.ASC). Now we can revoke the key and generate the key revocation certificate. Right-click again on your key pair, and select Revoke... from the context menu. PGP confirms that you actually want to revoke your key (click Yes). Now you'll have to type in your passphrase to unlock your private key and revoke the key. 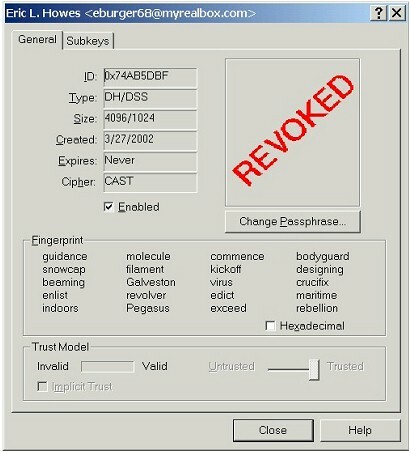 Once you've revoked your key, you'll notice that it is designated as "revoked" on your key ring (e.g., "Revoked DH/DSS key pair" under Description). 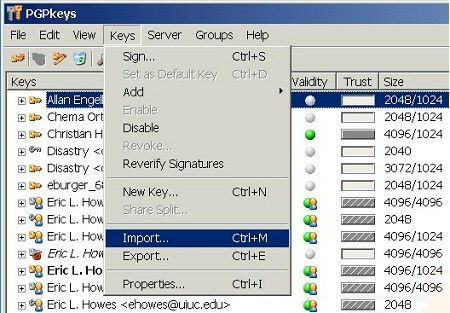 If you right-click on the key pair and select Key Properties, you'll see that the properties box for the key pair clearly specifies that the key is revoked. Once a key is revoked, it can't be used for encryption. Don't worry, though. In just a bit we're going to re-import our non-revoked key pair (which we created earlier) so that we can continue to use our PGP key pair. Now that we've revoked our key, we'll export a copy of the revoked public key to an ASCII Armored file (.ASC). This will be our key revocation certificate which we can store and use in the future. Right-click on your revoked key pair and select Export... (as we did above when we exported our key pair). This time, however, don't check the "Include Private Key(s)" box -- we're only exporting the public key (such as you do when you distribute your public key to others). Choose a different name for this key file, though (we don't want to overwrite our non-revoked key pair which we exported earlier). Once you click Save, you'll be returned to the main PGPkeys window. In addition to exporting a key revocation certificate to a file (as we just did), we can also print out a copy of the key revocation certificate. That's an additional layer of insurance, because we could still scan in that hard copy of the key revocation certificate and save it as a ASCII Armored file (.ASC), which is really just a plain text file. First, copy the revoked public key (which is essentially the key revocation certificate) to the clipboard. Right-click on your key pair and select Copy from the context menu. 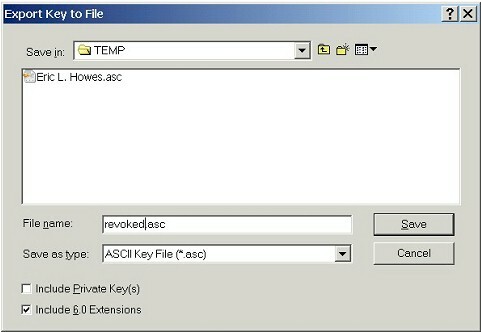 Then you can paste your revoked public key into a simple text file (you can use a simple text editor like Notepad). At this point you can print your key revocation certificate and store the hard copy in a safe place. Reportedly, a fixed width font like Courier works best for this process. And make sure the font size is big enough (12 pt. minimum). You ought to do testing with your hard copy once you've printed it. Getting an error-free scan can be tricky, so be prepared to do a bit of hand-editing once you scan the revoked key back in. Obviously, this hard copy would be an absolute last resort -- an ultimate fall-back when every other plan failed. 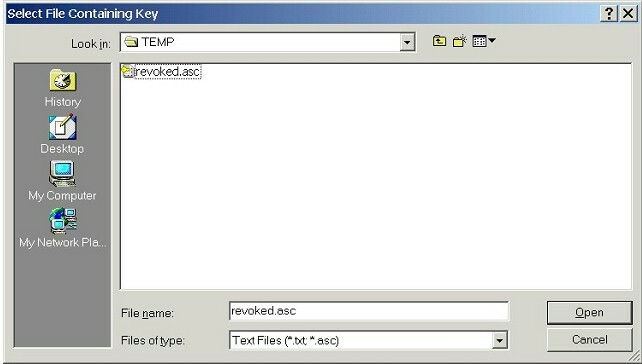 Now that we have a key revocation certificate saved as an ASCII Armored file (.ASC), we can delete the revoked copy of our key pair off of our key ring and re-import the good (non-revoked) copy. Right-click on your key pair and select Delete from the context menu. PGP will confirm that you actually want to delete the key pair from your key ring (click Yes). Now we're ready to re-import the non-revoked copy of our key pair which we generated earlier. ...and notify you that some of the keys are secret keys, for which you'll need to set the Trust level. To set the proper trust level on our key pair, bring up the Key Properties for that key pair (after you re-import it), and check "Implicit Trust." At this point you have a key revocation certificate (in the form of an ASCII Armored key file) and you have a non-revoked copy of your key pair back on your key ring. You should put some thought into how you want to store your key revocation certificate. Remember: this key revocation certificate is what you'll use to revoke your key when everything else goes wrong, so you should store this key revocation certificate in a safe place. At the very least you ought to move it to some form of removable media (floppy, CD-ROM, ZIP disk, etc.) so that you have it available even if your hard drive fails. If you're using PGP to protect critical or extremely sensitive data, of if you routinely use PGP to digitally sign messages and files to verify their origin and authenticity, then you might even want to consider distributing copies of your key revocation certificate to trusted third parties (known as "designated revokers") or consider storing a copy of your key revocation certificate off-site, perhaps even in a safe deposit box. If the time should ever come when you either lose the private key to your key pair or forget the passphrase to the private key, you can use your key revocation certificate to revoke your key. To import your key revocation certificate onto your key ring (and thus revoke your key), you can either double-click on the key revocation certificate file (.ASC) that you generated earlier, or you can import that file through PGPkeys, as we'll do here. Hit the Import button to import this revoked public key (your key revocation certificate) onto your key ring. ...and select the keyserver to which you want to send your revoked key. ...and notifies you when the revoked key has been uploaded. If you pick one of the larger, more well-used keyservers, most other keyservers will synchronize with it and receive your revoked key within a few days. People who search for and attempt to retrieve that key from the keyservers will be clearly notified that the key has been revoked, whether they search through PGPkeys or from a web form interface for the keyserver. They will also be able import a revoked copy of your key onto their key rings. More importantly, once your key is marked as revoked on their key rings, PGP will no longer let them use it to encrypt email to you. Finally, you can distribute your key revocation certificate to people with whom you frequently share PGP-encrypted email. You can send your correspondents the same key revocation certificate file (.ASC) that you imported onto your own key ring. Include a short explanation of why you revoked your key and ask them to import the key revocation certificate onto their own key rings to revoke your key. You might also consider posting a notice about and copy of the key revocation certificate to web pages from which you might have distributed that key. Again, once your key is marked as revoked on their key rings, PGP will no longer let your email correspondents use it to encrypt email to you. If you're serious about using PGP properly and safely, you owe it to yourself to check out both of these pages and pay close attention to the invaluable advice they offer.